This chapter dedicates discussion to certain peculiarities both as cultural and national in modern phenomena of “agility,” which generally bring more destruction in understanding rather than constructiveness. Manuscript's authors are often accused in over-opinionizm versus factography, but in fact, what is a fact of something being described by somebody if not an opinion of that someone, who managed the fact description. It's not just a syllogism since it's a concise logic of our life and here a number of opinions will be excavated from the number of practical consultancy cases. Consultancy teaches consulters that the world is imperfect, but they have to rant knowledge perfection calling to each excellence. There is no true excellence explain except trust in practice. It could be interesting to IT application specialist to get that much of his associations with “agility,” gained in practice, can't sustain yuppie's business vision. As well business will be surprised that his filling of agility is not applicable in digitalization nor directly or implicitly. Here is particular concentration of practical and empirical observations based on two decades of author's business consultancy queries and quests, but that does not imply that reader can't stay with his mind. A few can fill instinctively, others are proved by authorities, but anyhow humanity stands on the verge of great changes, demanding review of both nature and engineering or scientific understanding of the enterprise and its agility. These changes take place in the external environment as well as in actual enterprises, and often require revision of the paradigm, the system of values and objectives. A situation occurs where, according to Stafford Beer, ‘acceptable ideas are already ineffective and effective ideas are already not acceptable’. World leaders and high-profile companies suddenly turn into pale shadows and disappear in the bright lights of more successful competitors. Out of 47 world-class super companies, presented in the famous book by Tom Peters (Peters, et al., 2011), 14 companies have slipped and lost their shine in just a couple of years and recently 8 others followed. There are many examples of this process so no reason to continue the list. What are the reasons for renowned companies to lose their competitive advantage, and how these reasons might change our understanding of an enterprise? What scientific approaches need to be applied for that matter? What entities and roles are given to employees of enterprise, and how do we use their capabilities for the good of enterprise? What is the enterprise of the 21st century? This chapter contains ‘101-st North Korean alert’1 that again tries to answer the mentioned questions. 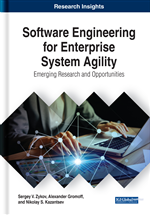 The framework of the chapter is based on logical construction of ‘agility’ perception as multi-dependent concept and in this respect here is an attempt to discuss all visible aspects of enterprise agility, firstly link by link. There is a hope that finally all links will be integrated in holistic picture for the visionaries, if not, don’t shoot … Next diagram on Figure 1 illustrates ‘agility’ as multidimensional concept. This concept is presented mainly from the position of semantic structure or taxonomical relationship. There are many other aspects or consideration angels, viewpoints, etc., which are simply impossible to reflect all together. As long you put a point, a voice from the corner will whisper ‘I assume that…’ and all starts again. Today world is a bit too enthusiastic in evangelizing of initiatives like Internet of things, industrial Internet, Industry 4.0, smart factory or city, cyber-physical system, human-machine team building, or whatever else. If to omit all synonymy and taxonomy one can obtain a very simple but more understandable world of reality and attempts to its digitalization in certain and particular parts. (Neubauer 2017, Kärscher 2015, Lüdtke 2015, Singer 2015). Absolutely not transparent matrix of all discussed initiatives appeared in today’s horizons mainly because of nearly each inventor believes in Porter’s mantra of success (Porter, 1998) - “obtain your advantage over others…” and they tried their best in finding advantages. Then one bright idea multiplied in thousands interpretations, applications, catchwords and so on.